for foreign short-term tourists to Japan, which can be used up to 6 times for 21 days. The long distance Ferry plies 14 route from Hokkaido to Kyushu. 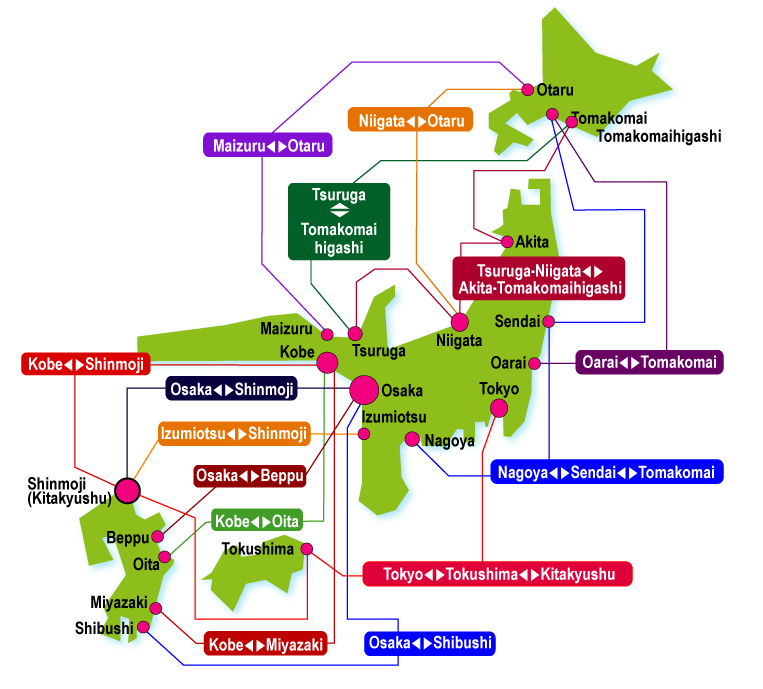 Metropolitan areas are from Tokyo to Tokushima through Kitakyushu and Ibaraki prefecture Oarai to Hokkaido route; from Nagoya around Sendai through Tomakomai higashi' is one route; from Osaka & Kobe there are 7 routes to the Kyushu area. On the Japan seaside the cities of Maizuru, Tsuruga, Niigata, Akita, Otaru are connected four routes. Altogether there are 14 long distance Ferry routes. Please click the route name that you want to look at. A list is displayed as follows.